The cuisine of the United States refers to food prepared in the United States. The European Colonization of the Americas gave way to introduction of many ingredients and cooking styles. These styles extended to the 19th and 20th centuries. Seafood have been in the United States since pre-Colonial times. Native American ate fish and other seafood in those times. Pizza is based on the traditional Italian dish which was brought to the U.S. by Italian immigrants. It varies, however, based on the style and development region. 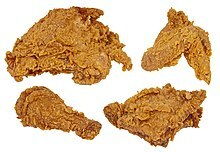 In the Southern United States, fried chicken is extremely popular, though it is eaten everywhere. This page was last changed on 9 March 2018, at 13:44.